Disclaimer: Analogies almost always hobble, limp, and may seem to express things that were unintended. Here, the term “old” should simply be interpreted as meaning experienced; veterans, if you will. The term “dogs” is an unfortunate accident of a well utilized adage that shifts understanding according to individual preference in pets. Had our linguistic history evolved differently, the term might have been replaced with “cat,” or “dolphin,” or any number of anthropomorphized biological entities. 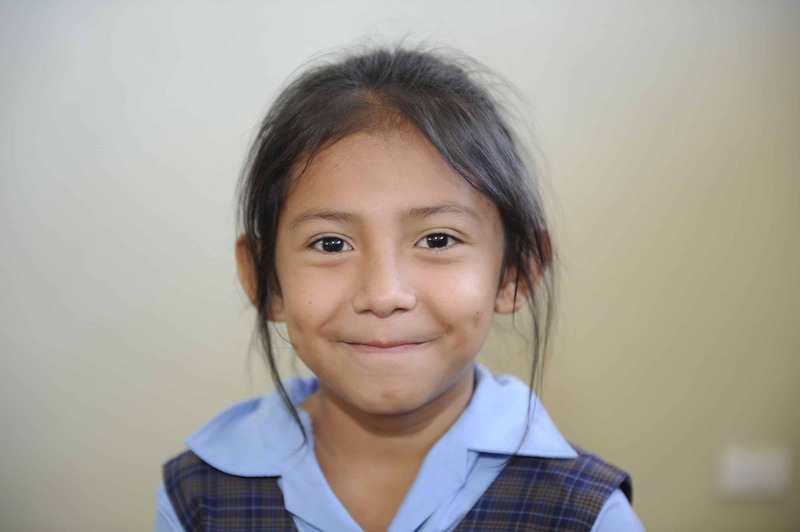 Emely is a third grader at the bilingual school in Camasca. She travels to and from the school a half hour each way with her father Wilson, the van driver, and fourteen other children from Concepcion. Emely was named in honor of Dr. Emily Harrison. 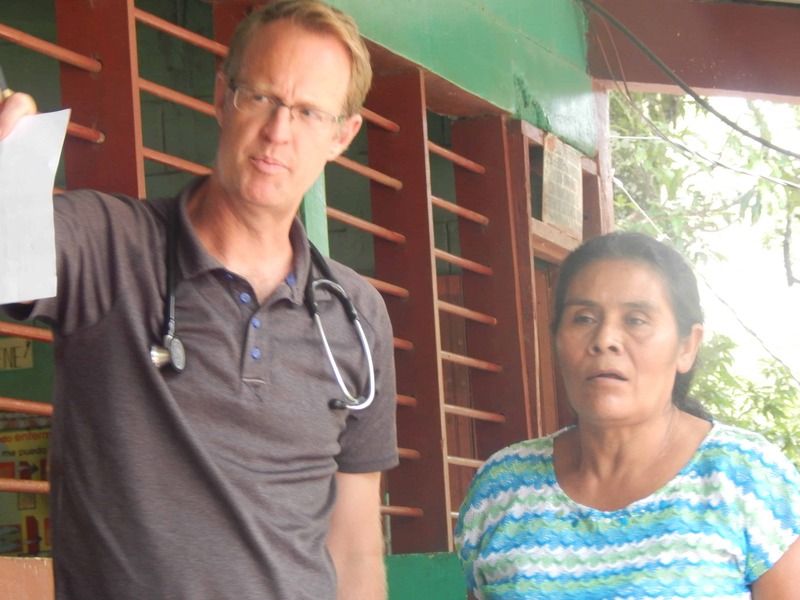 Dr. Harrison was recently at the Guachipilincito Clinic with Dr. David McKenna to run yet another successful medical service trip. Dr. Harrison has been faithfully coming here for years. The testament of her commitment is surpassed only by the integrity of the service that she and her teams have achieved within the community. I wonder what accounts for such dedication that has stayed so fresh and empowering. I meet Emily, as we almost always do with service trips, when they arrive at their hotel in La Esperanza. Most of the small group with her has been to Honduras with Shoulder to Shoulder on earlier trips. Dr. McKenna collaborated with the building of the clinic, has been here many times, and serves on the Board for the continuing mission. His daughter, Madeline, a senior at Notre Dame University, has also been here on many occasions, but I am meeting her for the first time. Robert Ashworth, the pharmacist, is on his third trip. 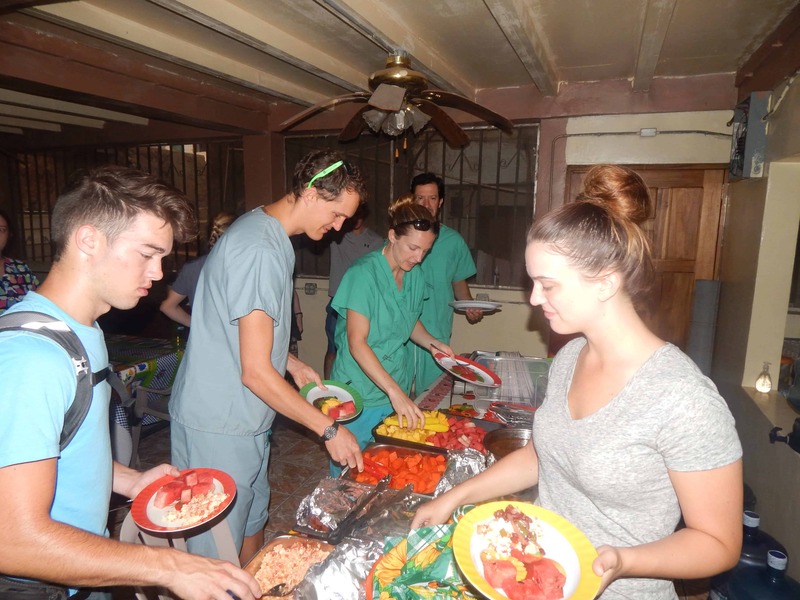 Two resident physicians, Shannon, who has been to Honduras, but not with Shoulder to Shoulder, and Keshia, who has been to Guatemala, complete the team. After putting her gear away in her room, Emily returns to the lobby and sits to my side on a sofa. Her wide, characteristic smile greets me and reminds me of how fortunate I am to count people like Emily as friends. She engages me with inquiries about what’s been going on since we last were together. “What’s going on for Laura and I personally? What’s new for Shoulder to Shoulder? 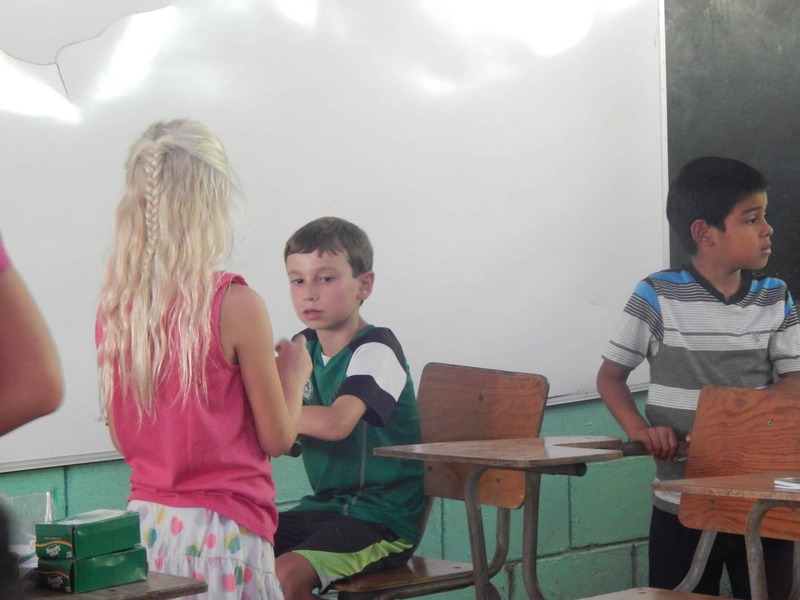 How is the work with education proceeding?” Her genuine interest would yield one to believe that she had never been to Honduras before this trip and knew nothing about Shoulder to Shoulder’s work. There is a freshness and enthusiasm present in her manner, like a freshman away from home at college for the first time. But this is not her first rodeo (yet another less than ideal metaphor), and none of this is new to her. The city she has come to, the hotel, her bus ride tomorrow to Concepcion (along newly paved roads), her pick up ride to Guachipilincito (along all too familiar unpaved and treacherous roads), the clinic, the people of the community, and the patients she will see are all old hat. And yet what seems to dominate her interactions with everything that should simply be routine, is the possibility of the new and the innovative; that something exciting and vibrant can spring forth at any moment. That attitude, that firm conviction, is what enlivens and gives meaning to this service. Among these old routines sprout new possibilities. This service trip in October is new. 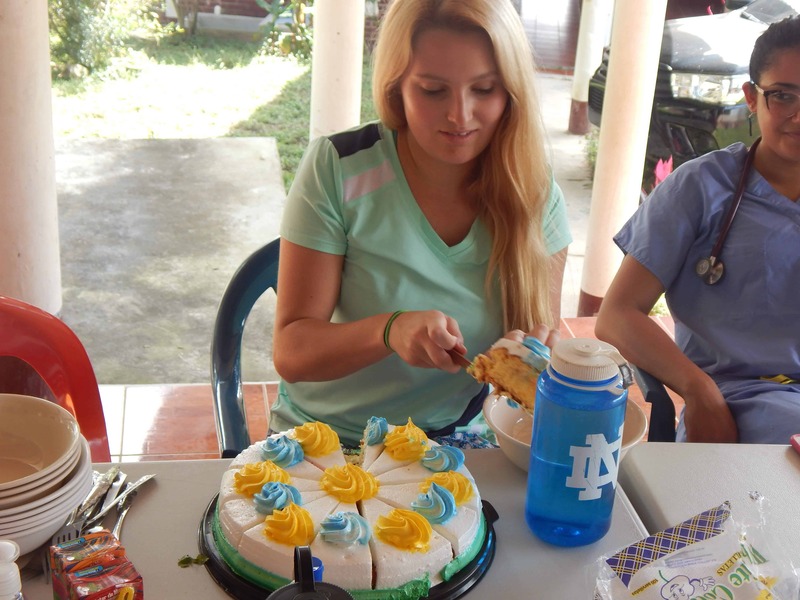 Brown/Wingate has been coming to Honduras twice a year, but this trip is the third trip this year, and the hope is that it will become a regular occurrence toward more sustainable service to the community. Additionally, Shoulder to Shoulder, with funding from Brown has just hired Iris as the Community Development Coordinator. She will work in the community when the service team is not on site to assess the needs of the community, run development and service programs, and provide feedback to Dr. Harrison and the Board as to best practices in maintaining a service mission in Guachipilincito. This development thrills Emily as it has been being planned and talked about for years. Now it has come to be, a realization of that commitment to developing meaningful, empowering service. Laura and I visit Guachipilincito and the service team on Wednesday. 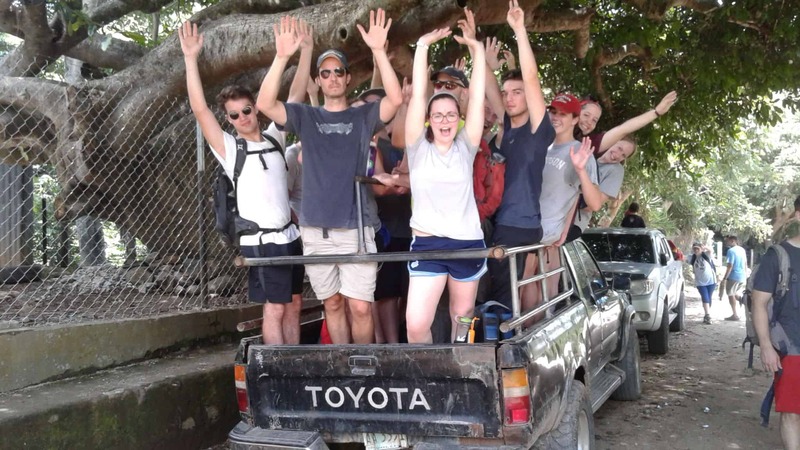 At first glance, it appears pretty much the same as all other service trips. They’re seeing patients. Some of them present serious illnesses and conditions, some are reviewing their management of chronic conditions, and some, as always, have come with complaints of pain that they hope will gain them a prescription for Tylenol. Not much new, or so it seems. We sit down to lunch. Madeline learned yesterday that she was accepted to one of the many medical schools to which she applied. It’s the University of Cincinnati, and that reminds her that Shoulder to Shoulder began because of the work of that university. The more things change, the more they remain the same. 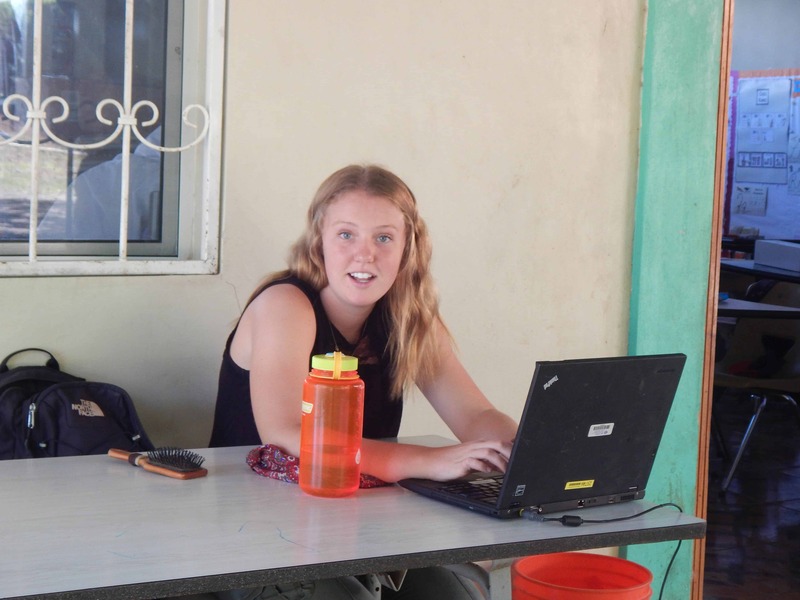 But Madeline is so committed to the work that she has been exposed to her whole life that she is considering volunteering at our bilingual school during a gap year. That is certainly something new growing out of the old. It’s reason to celebrate. ¡Felicidades! Congratuations, Maddy! We are the change that brings good to our world. Grace is a long-term volunteer working with Shoulder to Shoulder’s CREE (Centro Regional para Excelencia en Educación or Regional Center for Excellence in Education) program. She has been amazing at extending our impact in assisting local schools. This blog was also published on the learningequaily.org website blog. Shoulder to Shoulder’s education mission, CREE, focuses on bringing high quality education to rural areas where access is extremely limited. KA Lite has been one of our main methods in connecting these disconnected communities to better STEM education. To paint a picture, we are working in Southern Intibucá with a total population of about 70, 000. It is one of the poorest of the 18 “departments” (states) of Honduras. Shoulder to Shoulder has been working here for over 25 years. Currently, we have KA Lite deployed in three high schools and two grade schools, within three towns. There we have deployed a total of 7 servers and 230 tablets. In the high schools, we are covering math and science classes for the whole school. We are currently touching over 1,000 children, but teachers are still learning how to best use it. Slowly but surely, as our network is growing, word is spreading of this new method of learning and teaching. We have contacts and interest in many other towns and our expansion is ongoing. Our goal is to deploy KA Lite throughout all Intibucá over time, to about 15,000 students. Paul Carey (a StoS volunteer) and I are meeting with prospective educational leaders in neighboring towns. We leave each meeting so encouraged. We are working in a country where things move slowly – “Honduran Time” as we say – and many times promises to the poor never materialize. But those bus rides back from each town are filled with excited conversations, hope, and respect for the leaders that are so committed to bettering the education for their community. In the end, we are learning that taking our time and having patience is well worth it. Our mission is not to “give” and “bring” but to “train” and “form partners.” KA Lite is something to be integrated into the schools and for them to take ownership of – we are just here to light the fire a little. Our last meeting was in a town called Santa Lucia where we met Luis Pineda – the educational coordinator for his district. After installing and then training the professors at the high school on KA Lite, Luis came to us with a humbling request. Each town has various “aldeas” or villages that pertain to it in the surrounding mountainside. Luis has a big heart for the villages, as he worked most of his life in one in a grade school. He was one of three teachers, collectively teaching grades 1-6…a very typical situation. Whereas I see a huge lack of access to resources in the towns I’m going to, he attempted to paint a picture of how much worse it was for the villages, without any cell service or power much of the time. Their resources are much scarcer. Above all, he wanted us to know that he doesn’t want them to remain forgotten. His request was that we try to bring KA Lite, the bare minimum we are able to, even if it just a server, to these communities as well. Luis has the type of ideas and heart that will propel us forward. The best ideas come from the people themselves, right? 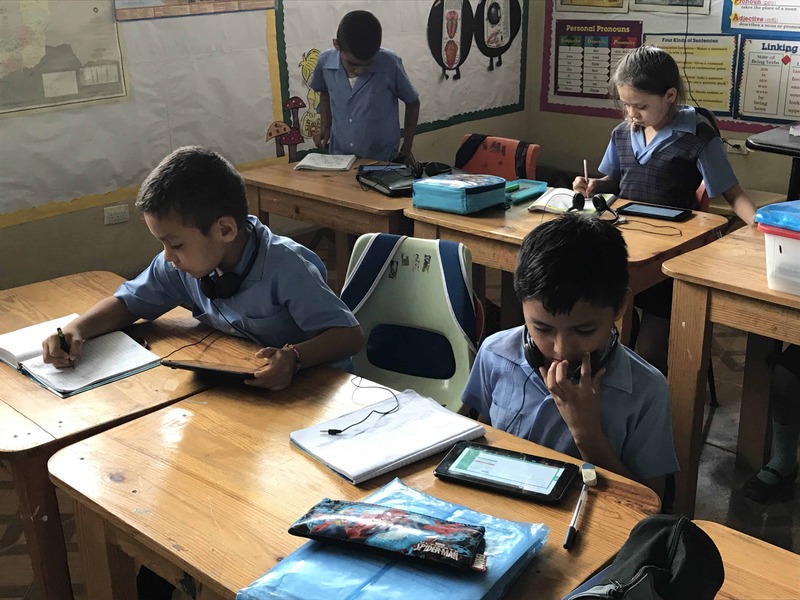 We have been so focused on getting into the main schools in towns – and we still will, but we want to shoot for the stars and see every child here in Intibucá with access to a better education. Only in the last five years or so have we started to turn our focus on education as well. Education is opportunity, opportunity is hope, and hope is something that children here in Honduras are so desperate for. Using the KA Lite technology has given us a visible manifestation of the hope these students possess within themselves to succeed. 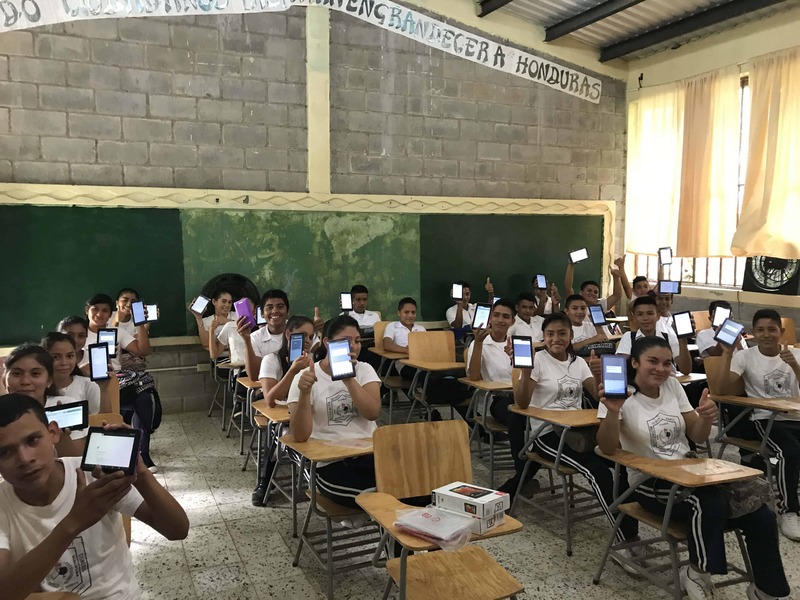 In the high school in Camasca, Intibucá, the math teacher Daniel tells us about his students literally running to his class to get their tablets. One boy broke a chair mid-run a few weeks back and now unfortunately has a fine to pay. In the Magdalena high school, the teachers set benchmark goals for the amount of points earned in KA Lite by each student per quarter. There are a few kids that have more than tripled the point requirement by coming into school early or staying after class to work ahead. Extra time at school is a huge sacrifice to many of these kids as their walks home can be hours in the mountain – yet to them it is worth it. I will never get tired of watching kids light up when it’s “KA Lite time” or training eager teachers how to use this technology in their classrooms. Jessica may have been wondering what role she could play, but Karol inspired her. Jessica now sponsors Karol at the school. They correspond regularly. 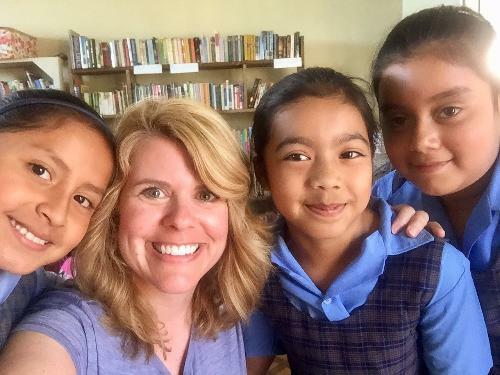 Jessica wants to bring her daughters to Honduras, and be part of an education service trip. Don’t know your role with Shoulder to Shoulder? Meet Karol. For about the price of a “half a sandwich” at a nice deli ($15) you can give Karol and many other children like her the opportunities that come with an excellent education. Our partner, GlobalGiving, is offering $50,000 in incentives on Thursday, October 5, 2017. 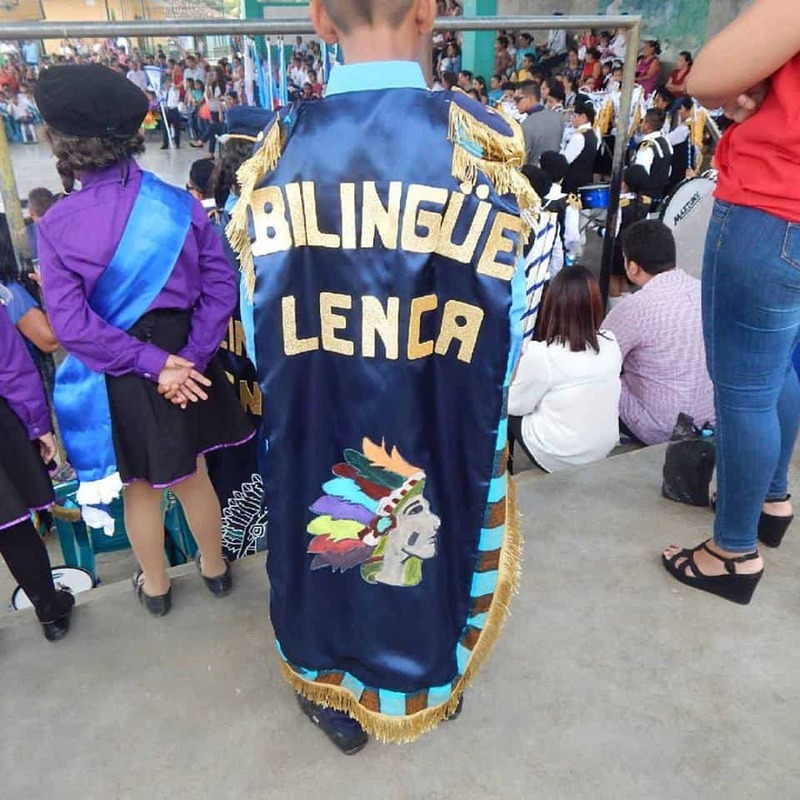 Your gift to Karol and the Bilingual Lenca School will be increased. Thursday, October 5, please take advantage of this incredible opportunity. 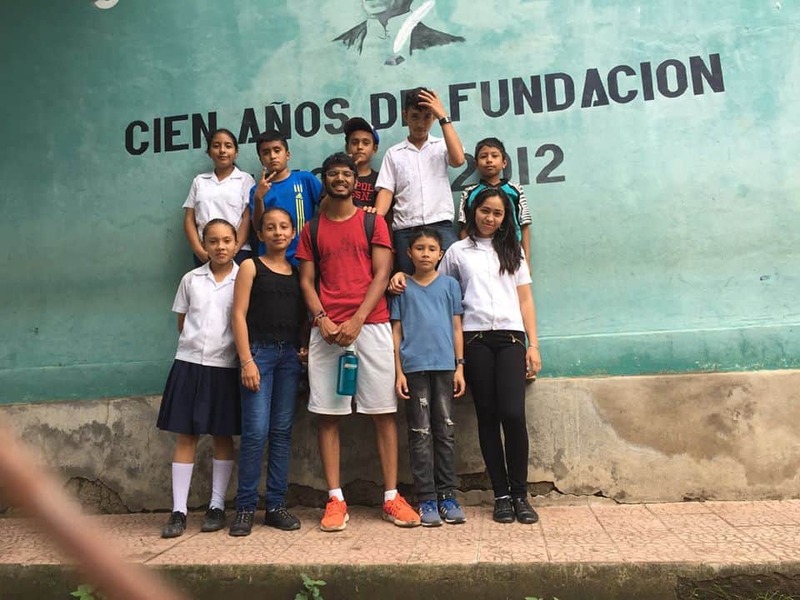 Matt Tibbitts, “Backpack Matt,” has returned for the second time to the Good Shepherd Bilingual School as a volunteer. He has wonderful gifts. You may have already seen his first video with us, “Changing Camasca.” He’s put together a second one featuring the smiles of all our children. Just Click the title below to see it. We are always looking to receive new groups and individuals to visit us and share in the incredible work of Shoulder to Shoulder. Principle among the reasons for this is that people are the primary resource for development work. Shoulder to Shoulder is built upon the commitment of so many who develop relationships with the people of Southern Intibucá. But the more selfish reason for looking for new individuals and groups is that we have such a great time being their hosts. Generally, it takes us a lot of work to develop relationships with universities and groups to bring them to Honduras. But sometimes our opportunities just seem to fall out of the sky into our laps. Sometime back in the Spring we got an email from an undergraduate student, Nava, at Duke University. 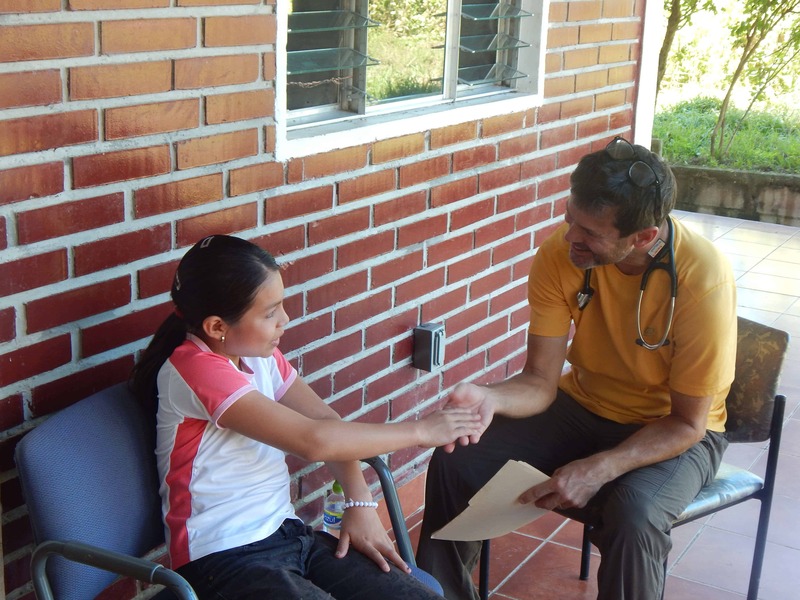 The group, Project HEAL (Health Education and Awareness in Latin America), had been coming to Honduras annually with another NGO. It wasn’t going to work this year, and Nava was a little desperate to find another NGO to host them. We, of course were ecstatic, and even though we had something to learn about what they intended to do, and even though they were coming at a very busy time of our year, we immediately said yes. We figured we’d work out the details as we went along. 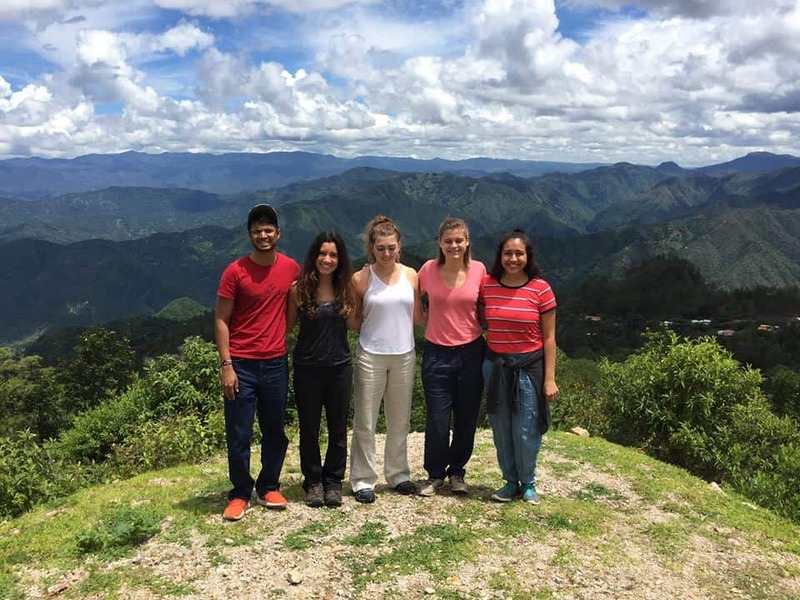 Five students, Nava, Noelle, Dahlia, Judy, and Lissa, would come to Camasca for five weeks to conduct four separate research projects on personal and community health issues. It would be during July and early August when Laura and I would be away for a time in the US; MAHEC would be here for two weeks in a forty person brigade; two MSW students from the University of Chicago would be doing an internship here. Then, to top it off, the surprise component would be that we would have to replace our brigade coordinator. Could we pull this off? Could we give Project HEAL a meaningful experience while we had so many other irons in the fire? Of course we could, and we did. They wanted to live with families while here to get more of a feel for life in Camasca. We’ve done a little of this with volunteers, but finding homes for five students for five weeks was a big challenge. We contacted the teachers at the local primary school, the Urbana, who have been looking for ways to partner with Shoulder to Shoulder. Three teachers agreed to take the five students. There was a little bit of a catch, however. 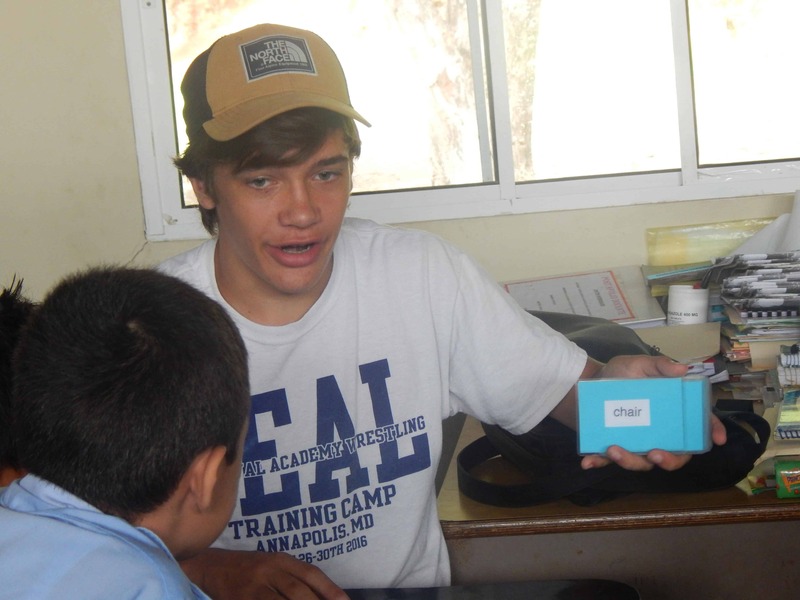 The Urbana wanted the students to teach English to the students while they were here. That wasn’t part of the project portfolio that Nava had given us. But when we approached him with the proposal, he graciously agreed. The students had never taught before. They had some anxiety about it when we picked them up in San Pedro Sula. But we had a feeling they might find some magic among the children. They busied themselves with their four projects: Teen Pregnancy and Relational Dynamics in Adolescents; Self-Esteem for Adolescents; Cervical Cancer Attitudes, Awareness, Prevention and Treatment; and Trash Disposal and Related Attitudes/Behaviors. They visited families in the town center and among our smaller communities, doing interviews and conducting focus groups. They gathered their data, analyzed it, and put together some community trainings. They returned to the families and groups, shared their results, and taught about healthy practices. They did great work, and they will share with Shoulder to Shoulder the reports on their topics. We’re certain these will become valuable tools as we continue the work they invested in and prepare for their return next year. I guess we could say they lived up to their project name and this was a ‘healing’ event. But we have a feeling that the really impactful moments of their time with us happened beyond their diligent work in a less anticipated way. We planned a debriefing with the group on the day before they were scheduled to leave Camasca. Their visit to our home happened immediately following their going away celebration at the Urbana School with the teachers and the students. We couldn’t start the debriefing right away because the five Duke students all arrived at our house in tears. The children, the teachers, and the families with whom they stayed, all expressed their affection for them and how much they would miss them. The kids had come so close to them — and they so close to the kids — that they had indeed become part of this community. The families now had adopted a son and four daughters, new brother and sisters, to the point that one of the Duke students was speaking to us of her cousin when we realized that it was a cousin of the family with whom she was staying. Their study was very important and meaningful, and yet the memories impressed on their hearts may have little to do with the particulars of their service. 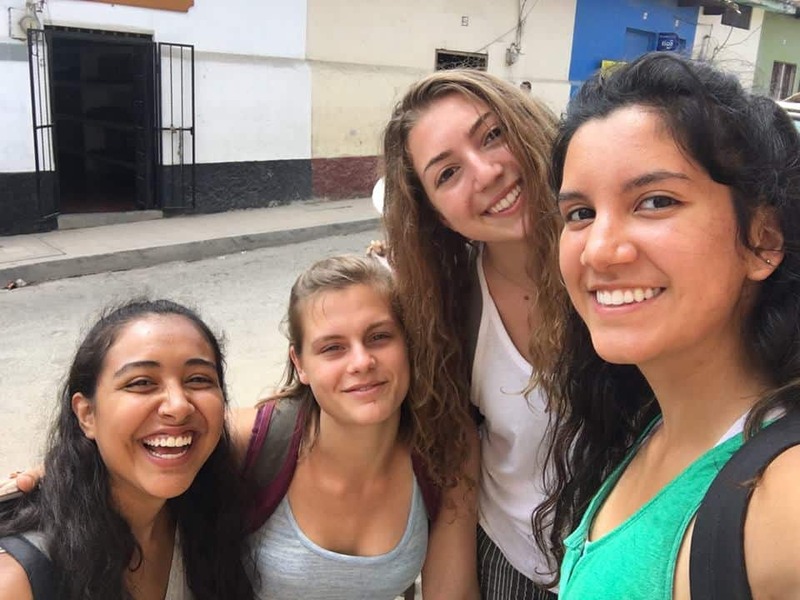 Their memories will forever include hiking up mountains, attending a rodeo during the town’s fair, taking a trip to the hot baths of Gracias, Lempira, being cared for by a second mother when suffering a stomach virus, and most especially the joyous smiles of children who are so welcoming of new friends. I suppose we often consider ‘healing’ a clinical response to persons who present themselves in need. We heal others when we diagnose their need and prescribe and initiate a treatment. But healing and finding health is so much more. It seems that these Duke students have taught and learned that healing is about meeting and being met, and ultimately loving and being loved. Nava, Noelle, Dahlia, Judy, and Lissa — you all have homes here. We look forward to your return. Remember when you were a little kid and you went to the circus? The clowns were always special. The iconic representation of this is when a little, colorful car pulled out into the circus ring with bells, whistles and honks, stopped in the center, and someone opened the door. Then the clowns started piling out of the car, seemingly way too many of them to have fit in the small car. Was there a trap door? Was it an optical illusion? Whatever it was, it was certainly entertaining. This is an apt metaphor from what we recently experience with the Mountain Area Health and Education Centers (MAHEC), brigade. All metaphors limp, and I don’t want to imply that the participants presented themselves as clowns. They were quite serious in why they were here, though they certainly were as colorful as clowns. There were 38 registered participants on the brigade. As if that weren’t enough, an undergraduate student who was on a different brigade in a different town joined them. Here, we have the expression, “there’s always room for one more on the bus.” There were yet more gringos in the town of Camasca during the ten days MAHEC was here. 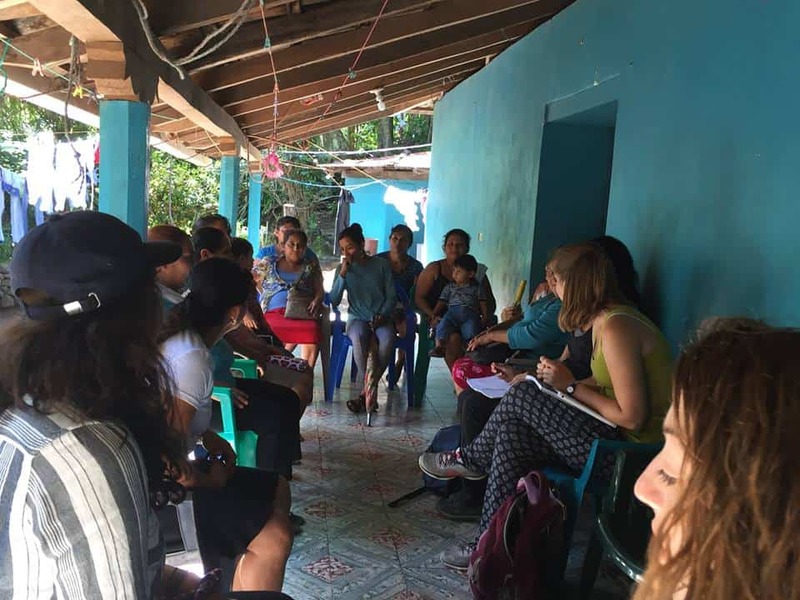 Four volunteers, two graduate social work students from the University of Chicago, five undergraduate students from Duke University’s Project HEAL (Health Education and Awareness in Latin America), and Laura and I brought the total number of gringos in Camasca to 51. The municipal district of Camasca has only 1,150 residents, meaning almost 5% of the people here were from the US. If they stayed any longer, shopkeepers would have put up signs announcing “English spoken here.” To be fair, in that group of 51, one was a Canadian citizen and another was a Honduran born in the US. Still, carrying on the metaphor, that’s a lot of clowns! But even as the numbers awed us and the people of Camasca, what was really amazing was their diversity. Even though MAHEC sponsored the trip, many came with other affiliations. Apart from the University of North Carolina, the schools of Butler University, Bucknell University, and Davidson College were represented. The Society of Friends from Lancaster, PA also came with six members of that church. Henry, now sixteen, was on his third trip to Camasca. As he has in the past, he spent a good deal of his time volunteering at the bilingual school. What we don’t usually see on medical mission trips are children or young people, but this trip was a family affair. Aside from Henry, there was: Gabriel (who turned 18 last month); twins Edward and Seth (16); Aislin (14); Kai (9); and Henry and Luya (both 7). All of them experienced the wonder of another culture; making friends among the young people of Camasca. There is always a spirit of joy when international, intercultural relationships are formed, but with children and young people, that spirit of joy seems transcendent and luminous. What was accomplished in those ten days was truly phenomenal. 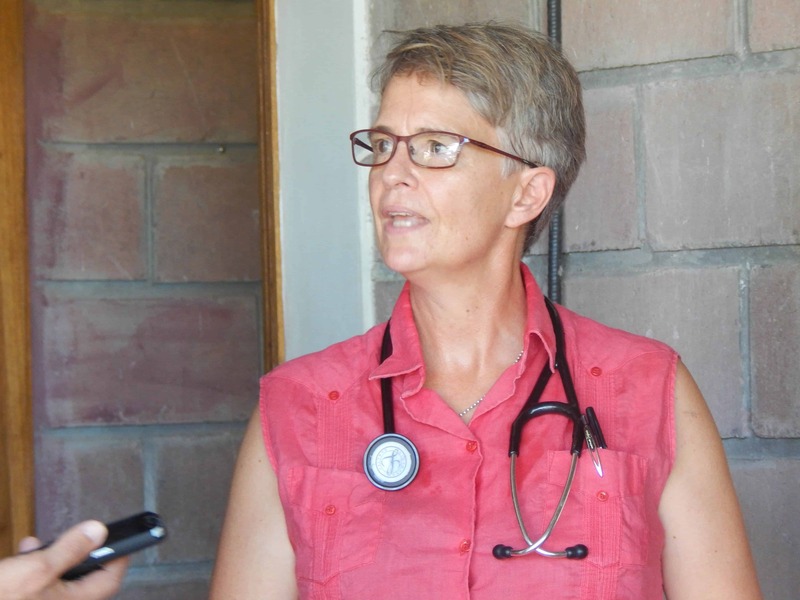 The medical part of the team visited seven small communities as well as the High School and the Health Center, with hundreds of consults and the delivery of much needed medication. The Society of Friends gave eye exams in the small communities, at the Bilingual School, and at the High School. Many were given eyeglasses and the gift of vision, something for which they had no previous opportunity to receive. This mission of eye care will be followed up on by future Shoulder to Shoulder teams. 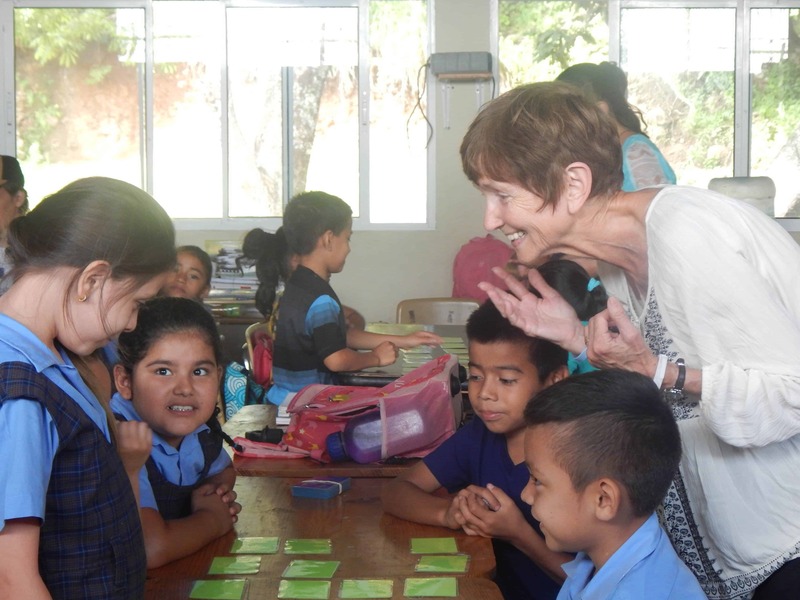 The Society of Friends also came to the bilingual school, playing and teaching our children. They also helped us install a water collection system at our newest building on the campus. Their time among us was certainly thrilling, and at the risk of killing my metaphor, it did remind me of the awe and excitement of when the circus came to town. There was a certain exotic character to it. Gringos are easily recognized here. The services they performed were certainly novel. Like high-wire acts, or trapeze swingers, the precision and expertize of their performance (their service) was exceptional. Perhaps, at times as well, their numbers and their colorful characters presented as clowns stepping out of a small car. But there is where the metaphor ends. The circus comes and goes, and whereas the electrifying experiences are remembered, the performers themselves are soon forgotten. They are itinerant, moving on to the next town without even a wave or a look back. But as the team of professionals and their families prepared to depart, we knew that we would miss them even more than the spectacular show they had given us. They are not performers and their intent was not to entertain. No, their presence was a genuine offer of friendship in service and justice. They have impressed themselves upon our hearts. They have given us so much more than their awesome service. They have given us themselves. We will remember them fondly and await their return. For all that they have done for us, but even more so for whom they are, we are grateful.